Could you provide the perfect family home for Sarge? Animal welfare experts are appealing for a home for Sarge - a personable six-year-old Boxer who’s currently in the care of Dogs Trust. A spokesperson said: “Sarge is a happy and friendly boy who loves spending time with people. Everyone who meets this delightful dog can’t help but fall in love with his adorable face and charming personality. “He enjoys relaxing at home, playing in the garden and munching on some yummy hotdogs. 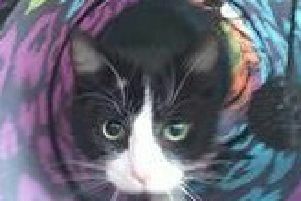 “This lovely boy travels well in the car and would love to explore new areas with his owner. He likes playing in water and would enjoy a trip to the beach or to a little lake. “Sarge can live with children around the age of 10 and above. He is also happy to say hello to other dogs when on walks but would prefer to be the only pet in the home. “He is a big boy that needs an active owner who can manage his strength when on walks. “He is on the lookout for a caring and sensible owner who can be at home for most of the day to help him settle into his new routine and to shower him in love”. For more information contact Dogs Trust rehoming centre (based in West Calder) on 01506 873 459.